THE Vancouver is a twin-engined flying-boat fitted with Armstrong Siddeley Lynx Mark IV direct-drive engines. It was designed by Canadian Vickers, Ltd., to a specification prepared by ДальшеMore>>> the R.C.A.F. and for use in connection with the suppression of forest fires, its duties being to transport men and fire-fighting equipment to fires reported by regular aerial fire patrols. Low landing speed, quick take-off, and high initial rate of climb are essentials for this type of work, as the only available landing places adjacent to or actually in the forests are small lakes, surrounded generally by thickly timbered hills. The Vancouver has been designed with these three primary considerations in view. The hull is entirely of duralumin, the construction being of the longitudinal type. The skin is supported internally by frames and a series of longitudinal stringers, these latter being continuous through all frames and bulkheads. There are three watertight bulkheads, extending the full depth of the hull, which divide the hull into four watertight compartments. A feature of the construction is that all sections are of the open type, thus facilitating inspection and preventing moisture from collecting in crevices. There are two cockpits and three hatches. The pilots' cockpits are forward of the wings and in tandem,, giving excellent view and permitting a clear walkway inside, so that all parts of the hull are accessible without interfering in any way with the pilots. The mooring hatch is in the nose and is furnished with every convenience for the stowing and handling of towing and mooring gear. The main cabin is immediately aft of the cockpits, and is separated from the internal walkway by a water-tight bulkhead in which is fitted a water-tight door. To help the loading of freight, the front cockpit is extended transversely, the extended opening being fitted with a hatch. The normal entrance to the main cabin is through a large quickly detachable hatch in the top of the hull. Collapsible seats are provided for six passengers, and there is sufficient room to stow a large quantity of equipment even when all seats are occupied. Aft of the main cabin, provision is made for stowing a collapsible canoe, and a hatch is provided to give access to this rear compartment. The interior of the hull has been kept very clear of obstruction so that quick loading and unloading is possible. The wings are arranged in the conventional biplane manner, the section used being Clark Y. Construction is of the normal two-spar type, spars and ribs being of spruce, and the internal bracing of duralumin struts and steel tie rods. The external bracing is of steel tubes and streamline wires. The engines are mounted as tractors in the wings on welded steel-tube nacelles, which also carry the oil tanks. No torque struts are fitted, all engine torque being taken by the front engine mounting interplane struts. Friese ailerons are fitted to the bottom wings only. All fuel is carried in the wings. Two main tanks with a total capacity of 110 Imperial gallons are carried in the top centre section, and the feed is Ly gravity direct to the engines. Either engine can be supplied from either or both main tanks. Two reserve tanks with a total capacity of 50 Imperial gallons are fitted in the bottom centre section. The reserve fuel is pumped by hand when required, to the main tanks. The complete tail unit is built up of welded steel tubes, and the tail plane is adjustable in flight from the pilot's cockpits. The controls are dual-wheel type, and one set can be quickly detached. Two-bladed standard steel airscrews are fitted. A novel beaching gear has been designed for use with this machine. This gear is so arranged that it can be readily attached by the crew while the machine is on the water. The tail support consists of a pneumatic wheel which, by an ingenious arrangement, can be attached and locked from the deck, in the bottom of the hull just aft of the rear step. The machine can then be beached without outside assistance. The principal characteristics of the Vancouver with D.D. Lynx Mark IV engines are: span, 55 ft.; length, 37 ft. 6 in. ; height, 15 ft. 8 in. ; wing area, 772 sq. ft.; weight empty (including all equipment), 4,300 lbs. ; allowable all up weight with I.C.A.N. factors, 6,310 lbs. ; fuel and pay load, 2,010 lbs. ; top speed, 101 m.p.h. ; cruising speed, 90 m.p.h. ; rate of climb at G.L., 650 ft. per minute; service ceiling, 12,500 ft.; landing speed, 45 m.p.h. ; range at cruising speed with normal fuel, 400 miles; time to get off water, 10 secs. The machine is now going into production fitted with either geared Lynx or Wright J.6 300-h.p. engines, when the allowable all up weight will be increased to 7,000 lbs. without overload. The design factors will be still I.C.A.N., and a considerable increase in performance is expected. 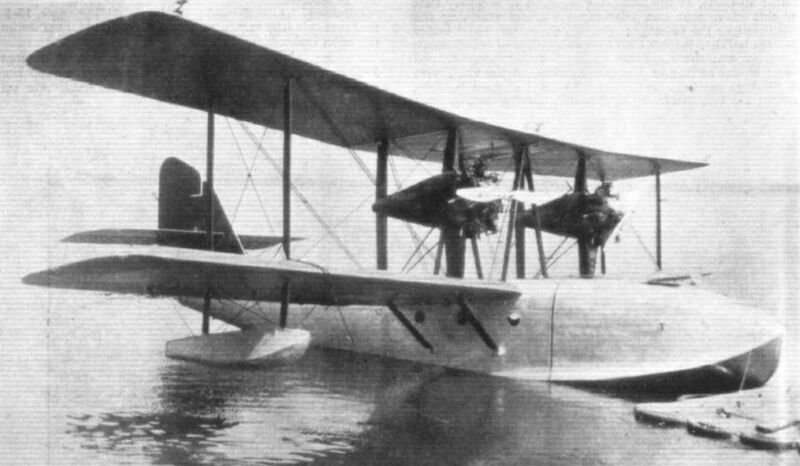 SINCE we described (in our issue of November 22, 1929) the "Vancouver, Mark I" flying boat produced by Canadian Vickers, Ltd., of Montreal, the Mark II model has made its appearance. The Mark II is similar generally to the Mark I, but several modifications and improvements have been introduced, resulting in better performance. The "Vancouver" is particularly suitable for commercial air services on medium routes, although it is primarily intended for forest-fire patrol work. In fact, five of these flying boats (the Mark II) were built for the Department of National Defence, Ottawa, last year to replace obsolete aircraft used by the Royal Canadian Air Force on forest fire patrol. Three of these machines were fitted with Armstrong Siddeley geared "Lynx" engines, and the other two with Canadian Wright J-6 300-h.p. engines. The machine is a twin-engined flying boat with accommodation for six passengers and two pilots. The passenger accommodation consists of a completely enclosed cabin provided with port-holes, while the pilot and mechanic are accommodated in cockpits in the forward part of the hull. The hull is entirely of metal construction, all frames and stringers, as well as the outer skin, being of duralumin. Entrance to the cabin is obtained from a rear hatch, and a connecting door is fitted giving access from the pilot's cockpit to the cabin. A hatch is provided in the extreme forward part of the hull for ease of mooring. The power plant consists of two Wright J-6 300-h.p. engines. However, two Armstrong-Siddeley geared "Lynx" engines or Pratt and Whitney "Wasp" 400 h.p. engines can be installed, if desired. 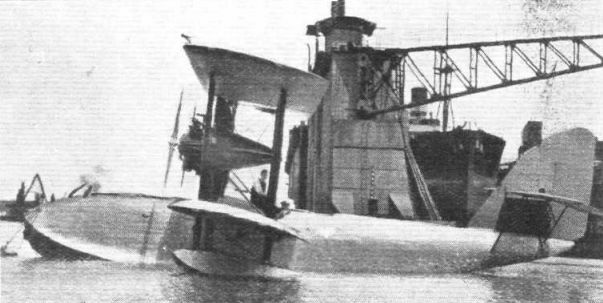 The engines are placed as tractors between the top and bottom wings at some distance either side of the hull. Oil tanks are fitted in the nacelle and the main fuel tanks in the top wing. Auxiliary fuel tanks are provided as standard equipment, although Eclipse electric starters and generators can be fitted, if desired, adjustable metal propellers are standard equipment. The wing structure is of the biplane type. The wings are of wooden construction, fabric-covered, with duralumin tube compression struts and wire internal bracing. The interplane struts are of steel tube with streamline wire bracing, wingtip floats being of duralumin construction. The following are fitted as standard equipment :- Instruments - Airspeed indicator; altimeter, turn and bank indicator; rate of climb indicator; eight-day clock; P-3 compass; two r.p.m. indicators; two oil-pressure gauges; two oil thermometers; two fuel contents gauges; two fuel-pressure gauges; complete set of mooring and navigation lights. Miscellaneous Equipment - 45-lb. anchor; boat hook; wing lines; set of canvas cockpit covers, and four fire extinguishers. Other instruments, such as voltmeter and ammeter for electric generator, etc., if installed, can be fitted at extra cost. An easily demountable undercarriage type of beaching gear can be supplied at extra cost. This beaching gear, which is equipped with two main wheels and tail wheel, can be readily fitted or removed by the crew of the machine without the assistance of a landing party, enabling the machine to be run on the beach or runway under its own power. Handley Page automatic slots can be fitted to the machine, if desired, at extra cost. The Canadian Vickers Vancouver I, powered by two Lynx IV radials. A pair of Canadian Vickers Vancouver II flying boats, with G-CYVR nearest, moored at a very temporary base in the heart of forest land. Canadian Vickers "Vancouver" Flying-boats at Vancouver Royal Canadian Air Force Station.